The WAL-C-4XM-125 Quadpod Mini Light Tower from Larson Electronics produces 400,000 lumens of light. This adjustable light tower is designed for rugged yet portable use and is ideal for use in demanding industrial and outdoor construction conditions. The WAL-C-4XM-125 is a quadpod mounted mini light tower and provides 400,000 lumens of light output. 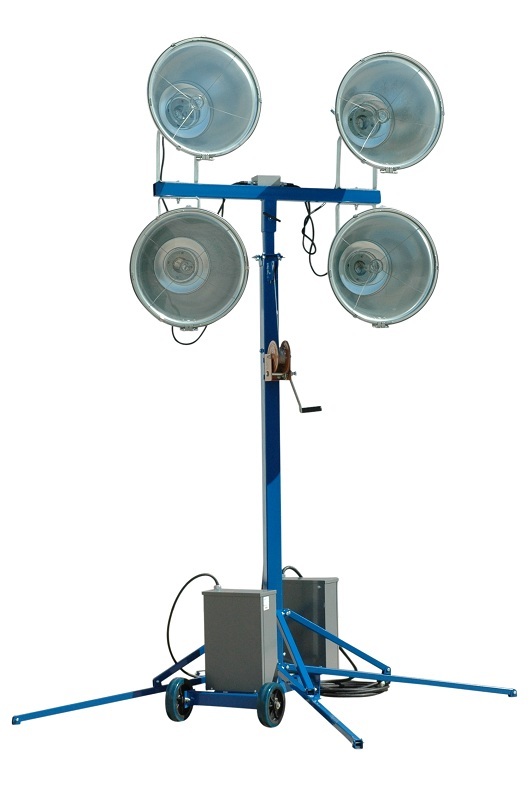 This portable light tower has a removable four light head assembly mounted on top of a four leg steel quadpod equipped with 10 inch wheels for easy positioning of the unit from one area of the workspace to another. The light assembly on this unit produces a wide flood pattern of light that is ideal for illuminating large workspaces and jobsites. This light is designed for heavy duty use in demanding conditions including emergency services, mining, construction, marine, and industrial operations where durability and portability is important. 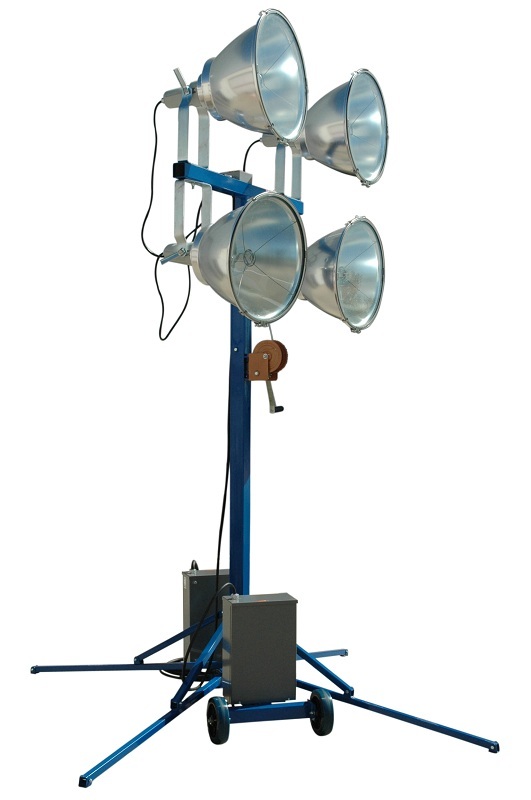 This portable light tower is comprised of a removable light assembly fitted with four metal halide lamps mounted atop a four leg tripod fabricated from heavy duty steel. This adjustable and collapsible quadpod pod can be extended to fourteen feet and collapsed to seven feet and is locked into position with t-handle locking pins. The unit is extended and lowered using an included hand crank cable winch equipped with a brake for fast and safe deployment. Included solid wheels allow the operator to tilt the unit back and simply roll the entire assembly to a new location when fully deployed. The light fixture assembly can be removed by releasing the hand knob and sliding the light and mounting bracket off of the center support while the legs can be collapsed, aiding in deployment, storage and transport. The lamps can be easily adjusted up, down or from side to side independently of each other and locked into position for maximum coverage of the work area. Included with this quadpod tower is 125 feet of 8/3 SOOW cord and a 50A twist lock plug which combined with the full adjustability of the light heads helps provide optimal coverage of the workspace. The easy to collapse design of this mini light tower allows users to easily break down and transport the unit yet is durable enough for any industrial or commercial application. The light head assembly on this tower contains four 1000 watt metal halide lamps producing 110,000 lumens each. These lamps are independently adjustable, allowing operators to adjust each light for maximum coverage of the workspace. An included control box containing the ballast is included and features a built in On/off switch. This tower operates on 120V, 208V, 240V, or 277V AC. Please see options below.